Kitchen Makeover Ideas - The Kitchen Facelift Company - A New look for less! drawer fronts to any colour you like. There is nothing worse than the kitchen doors banging shut, it is much nicer if they close silently and smoothly using soft close hinges, they will also put less strain on the hinges and doors. No kitchen makeover is complete without a good quality soft close mechanism. Our hinges incorporate "Gas Spring Technology" the piston is incorporated into the hinge so there are no unsightly clip on units. The hinges come complete with backplate, resulting in a like for like hinge exchange with your existing cabinets. You will need 2 soft close hinges per door and are easily exchanged for your existing hinges. Changing your kitchen door handles or knobs can make a big difference to the look and feel of your kitchen. It is easy to do and you can even change from a knob to a handle using the existing hole. We have a wide collection of traditional and contemporary door furniture to perfectly finish any kitchen cabinet door. Made to measure kitchen doors in many sizes and colours. having to throw your old kitchen away. and drawer fronts your kitchen will be make to look like new! Quick and easy DIY installation - we can show you how with our free kitchen measure and fit instruction PDF. 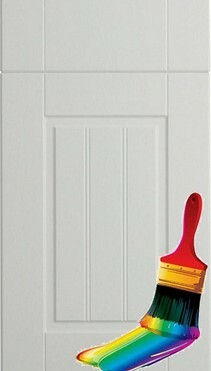 for you or a good decorator to hand paint your existing cupboard doors. styles which you can also paint any colour you like. You can have your own individual styled kitchen on a budget!